The US have had a good tournament, just. If they hadn’t scored that last-gasp winner against Algeria I wouldn’t be writing that but they did, and now they’re playing Ghana for a place in the World Cup quarter-finals. The real reason I think they’ve had a good tournament is because they’ve been playing well and deserved to top Group C ahead of England. No doubt many Americans will feel that they shouldn’t find it too difficult to get past Ghana. However, they’d be forgetting that in the last World Cup Ghana beat them in the group stage and kicked them out in shame. Ghana are a strong, fast side which the US will find difficult to beat. History repeats itself as Ghana again kicks the US out of the World Cup! By doing so, Ghana will become only the third African team to reach the World Cup quarter-finals following in the footsteps of Cameroon in 1990 and Senegal in 2002. This will go some way towards restoring some pride for the African teams which were expected to do better in this African World Cup. This is the big one, the biggest tie of the round, and it’s going to be very, very close. With the way things have gone so far you’d have to think that Germany will take it. But England have been improving (they had to), and should give a good account of themselves. A lot of English fans are dreading this one because Germany always come out on top versus the English in major competitions. It’s quite phenomenal really. But this is a one-off, and teams have to actually go out and win games if they want to go through. Winning on paper doesn’t mean jack, just look at England in the group stage. There are a number of factors which will play a part in deciding who eventually goes through. One of those is that bloody stupid ball, the Jabulani. The Germans have been playing with it in the Bundesliga, and so have a slight edge over the English who didn’t see it until the World Cup. However, I don’t think this will make a big difference as England have had plenty of time to get used to the ball now and should be able to control it at almost the same level as the Germans. It is not so inconceivable to see the English advancing when you look at this match in terms of the Bundesliga vs. the Premiership. German teams did better in Europe this year but on the whole, English teams do much better in Europe. If the English can bring the same verve and tenacity to this game that they did in their last match against Slovenia, then they should be able to take control of the game and win it. England wins! This should happen in normal time but it might go to extra-time and penalties. Rooney’s been negatively affected by the altitude so far, but he should be back to his best for this one. England play better in big games, and they don’t get much bigger than this. It’s the last World Cup for many English players and this will play a part in the passion, drive, and commitment that the English players will show to knock out the Germans. I’d rather England play well, and lose; than they play like crap, and go through. COMON ENGLAND! PS: If it does go to penalties, the English have been talking about picking a side of the goal and not changing that decision when taking a penalty. If the Germans do their homework right, they should know what that side is. The goalie can then throw the penalty taker off by covering that side of the goal more than the other. Will the English penalty taker still choose to shoot in his original direction when he’s at such a disadvantage? England v. Slovenia: England are crap, very crap. So bad in fact, that I’d say they were involved in the worst match of the competition last time around when they drew 0-0 with Algeria. Slovenia on the other hand have been playing very well and should’ve beaten the US last time around when they went two goals up. So, everything points towards the Slovenians at least getting a draw and advancing to the next round. However, I just can’t see England leaving South Africa this early in the competition. At some point they have to play better and get a result. Verdict: England should come through with a win. I’m not sure if they’ll play well, but they should just about do enough to make it through. The English heartache will have to wait for another day. USA v. Algeria: Algeria still has a chance of advancing if they can beat the US so I don’t think they’re going to roll over without a fight here. Depending on how things go in the other match, the US really needs to win to be sure of qualification. This is gonna be a tense one. 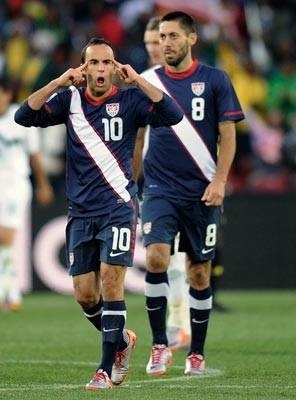 If the US can play like how they did in the second half of their last match the win is theirs. If it’s anything less though, and if Algeria can somehow manage to up their game they might get eliminated. Verdict: This is going to be really close and ultimately, the US will not be able to squeeze out the win that they need to advance. 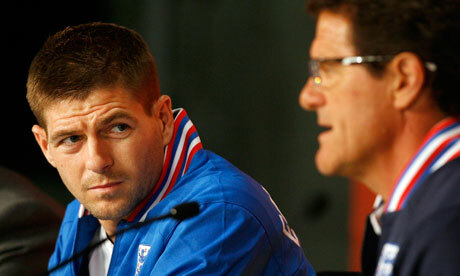 England will win the group by beating Slovenia, and Slovenia will qualify in second place. The US and Algeria are eliminated. Yesterday was a day full of upsets. It started off with Germany losing 1-0 to Serbia. After thrashing Australia in their opening fixture, Germany had become many people’s tournament favourites. They even missed a penalty which hardly ever happens. Then came game #2 for the teams in Group C. The first match was the best of the tournament so far, the second the worst. Initially, the US started in the worst possible manner against Slovenia and were 2-0 down at the break. However, their manager had the balls to make a couple of changes at half time which paid dividends. The second half started with Landon Donovan in inspired form, scoring almost immediately. When that happened, you knew Slovenia were in trouble and the second half would be brilliant. Right after that goal, the US had a free kick which almost went in, that would’ve been some comeback with two goals in the first 5 minutes since the restart. Chance after chance came the US’s way and Slovenia had to revert to a number of illegal challenges to stop the US scoring. They were handed 3 yellow cards in 6 minutes which meant that there could even be a sending off before the end of the match. That didn’t happen, but the US did score, twice. 8 minutes from time the manager’s son, Michael Bradley, finally got the goal that the US needed to stay in the World Cup. Can you imagine how his dad must have felt seeing that from the bench? Another 4 minutes later came another goal for the US. However the referee incorrectly ruled it offside and it was disallowed. If anything, the goal should’ve stood or the US should’ve been given a penalty as Slovenian players were holding back 3 Americans from scoring. The match finished 2-2. There will be many Americans who’ll feel the ref was paid or the game was fixed but wrong decisions are a part of the game in football unfortunately. There’s no video replay so whatever the ref sees at the moment of play is the only thing he has to use to make a decision. Disallowing the last goal doesn’t make any sense at all the more you see the replays. However, the US shouldn’t have needed to score a third goal to beat Slovenia so you can also look at the poor US defending in the first half as the reason that this match slipped away from them. Whatever, the US still has a great chance of progressing provided there isn’t another upset when they play Algeria in their last group match. England are in exactly the same position after their hugely disappointing 0-0 draw with Algeria later on in the same day. Both sides need to win their last group matches to be assured of qualification for the next round. Anything less than that will be a massive embarrassment, but at least the US will always have their match against Slovenia to look back upon and draw confidence from the way they fought back. They fought like bloody lions in the second half. Altidore in particular was a real handful, and gets the MOTM award for me. If he plays anything like this when he gets back to domestic football it’ll be a real treat to watch. I’m not gonna write much about England b/c I’m so disappointed with their performance yesterday. They’re on the same number of points as the US but in terms of passion, they were worlds apart yesterday. Yesterday, the US team was hot as hell. If you’re American, you can wave your flag with pride. The English on the other hand, must feel like burying their heads in the sand. -MOTM in the England game should go to David James in goal. He was a commanding presence and didn’t put a foot wrong. At least one person had a good match. -The US match was the first one that I’ve noticed where you could actually hear fans chanting and the crowd reacting to goals. That place must have been full of American fans. Argentina will win the World Cup. There it is, that’s my prediction. After watching them annihilate a decent side yesterday, South Korea, they have to be one of the favourites and will probably top their group with a 100% record. South Korea are still likely to qualify for the second round which makes Argentina’s demolition of them in the second half of their match all the more impressive. Messi was wicked, as expected, but the Argentinean forward line in general is hard to match, even by the Spanish. 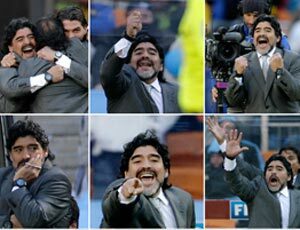 But the best thing about Argentina is their manager, Maradona. MARADONA.IS.THE.MAN. Voted the best player in world ever by the public, he’s now getting stuck into international management after going through an absolute nightmare trying to get Argentina into the World Cup. It’s because of that nightmare qualifying campaign that many people doubt his abilities as a manager and wrote off Argentina as potential winners of the 2010 World Cup. Well he’s proving them wrong now. I want Argentina to win this World Cup for his sake more than anyone else’s since he was robbed at USA ’94. However, should Argentina take the cup, it’ll also prove to everyone that there is no doubt that Lionel Messi is the world’s greatest footballing talent at this moment. Some people say you have to win a World Cup to be considered truly great (yes I’m talking about you Amir bhai) and I suppose they’ve got a point. Pele, Maradona, and Zidane have all got World Cups to their credit and I feel Messi should be placed in the same category as those players based on his career so far. Bad luck Rooney. You may be good, but you’re not THAT good. Maybe England will win the World Cup with Rooney one day but that won’t be this year. This year’s all about Argentina. England v. Algeria: I can’t see this going any other way apart from an England win, and hopefully a comfortable win at that. Expect Gerrard to score again b/c he’s wicked, and possibly Rooney as well (who also isn’t bad ;). Verdict: The English will think the World Cup is theirs for the taking with a 3-0 win. USA v. Slovenia: The US is expected to win this one but right now Slovenia is topping the group after their win against Algeria. I don’t think this’ll be as easy as the US expect it to be and there could even be an upset in the cards with either a draw or a win for the Slovaks. I doubt Slovenia will win though since a loss would mean the US would be out of the World Cup and they will fight hard against that. Verdict: Despite what I just wrote, the US should pick things up and squeeze through with a 1-0 win. Sumeera picked Argentina for the World Cup before the tournament even started. Credit where credit is due, she beat me to it! We’re gonna look really dumb now if Argentina flop. The opening round of the World Cup ended with a bang with Switzerland, a mediocre European team, beating the pre-tournament favourites, Spain. About bloody time. This World Cup has been really boring so far. Almost every match is low scoring with with the end result either being 0-0, 1-1, or 1-0. 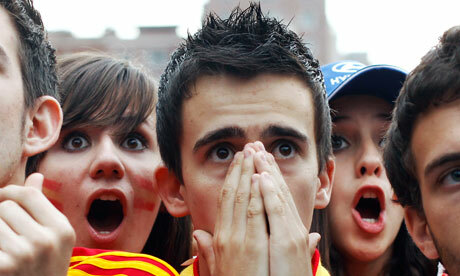 Maybe the shock of Spain’s loss will liven things up a bit. I still fully expect Spain to qualify for the next round, and even win the World Cup, but they’ll have to do a lot better to do that. This loss doesn’t suddenly mean that Spain can’t be considered serious contenders for the World Cup, it was after all only their second loss out of 37 matches – a run which started shortly after exiting the last World Cup in 2006. They’ll probably make up for this loss with a huge win in their next match. And with Spain’s loss (or Switzerland’s win), the first round of matches came to an end. Now the real fun begins…I hope! Things started promisingly last night with a 3-0 win for Uruguay over South Africa. This was the first match of the second round of matches of the opening group stage of the World Cup. Now the teams which disappointed in their first matches have to improve and get something from their second matches to qualify for the next round. I think teams were more afraid of losing than anything else in their opening fixtures which is why there were so many poor matches and draws. But with their second games, teams have to come out and play, take risks, score or be scored upon, to stay in the World Cup. BRING.IT.ONN! Argentina vs. South Korea: Hopefully this’ll be another win for El-Diego and his boys but it could also be a draw. Both teams won their first matches so they’re the favourites from their group to move on. France vs. Mexico: Both teams drew their opening fixtures so this is going to be another hard one to call. France are crap, and Mexico are looking a little shaky (but who hasn’t?). I can’t see France winning, which means it’ll either be a win for Mexico or a draw. The safe bet would be a draw with the way things have been going so far.